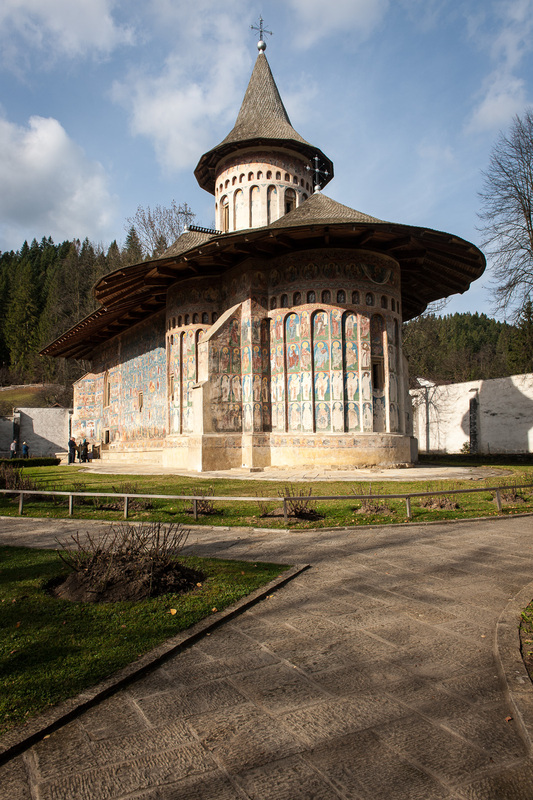 Today, our tour took us to four of the eight Painted Monasteries of Bucovina which are now UNESCO heritage sites. This was definitely the highlight of our little vacation. 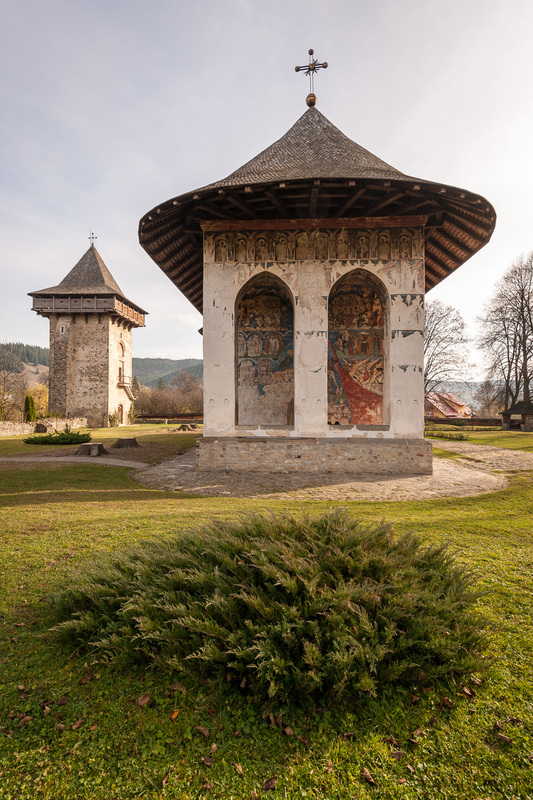 Our first stop was at the Humor Monastery near the Romanian town of Gura Humorului. It is a monastery for nuns. 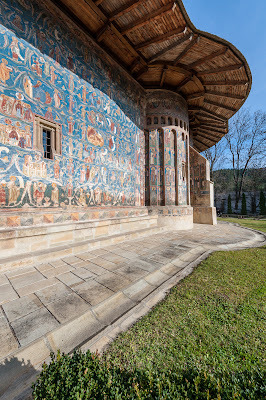 The current structure was built in 1530 by Petru Rareş the son of Stefan the Great. 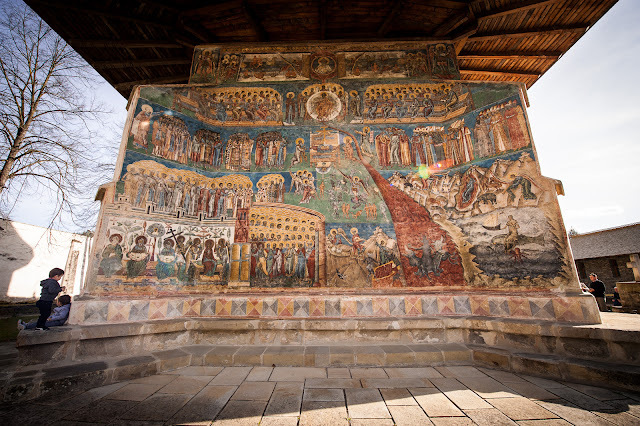 Petru Rareş is responsible for creating the exterior frescoes on the "Painted Monasteries." 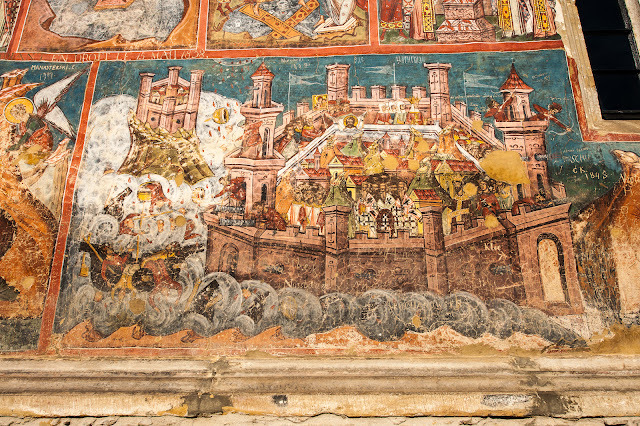 Red and brown are the predominant colors of the frescos of Humor Monastery. The colors were created from minerals. 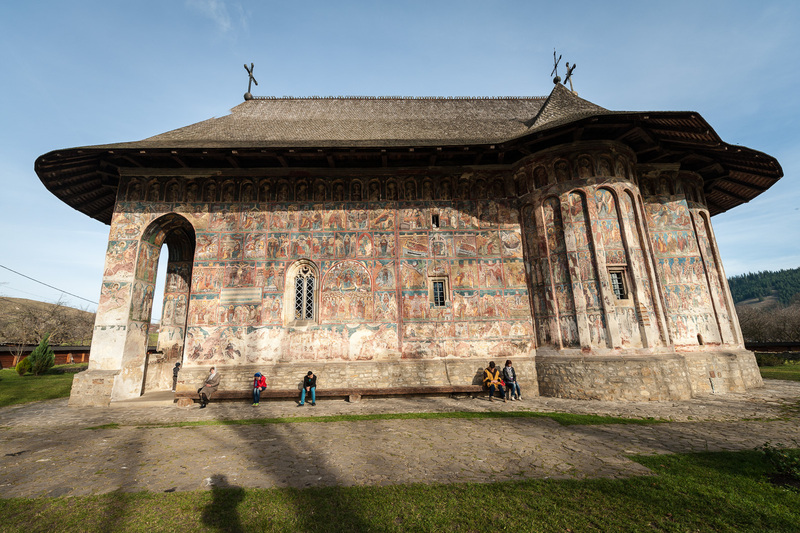 The exterior frescoes are in pretty good shape for being almost 500 years old, but the north side has mostly been erased by weather. Not far away is the Voronet Monastery, a convent, that was also built by Stefan the Great and Daniil the Hermit (confessor to Stefan) in less than 4 months during 1488. Blue is the predominant color of the frescoes on this monastery. The blue was created from lapis lazuli and is so brilliant that the color is known as Voronet Blue. The frescos were painted in 1547 at the direction of Stefan's son, Petru Rareş. 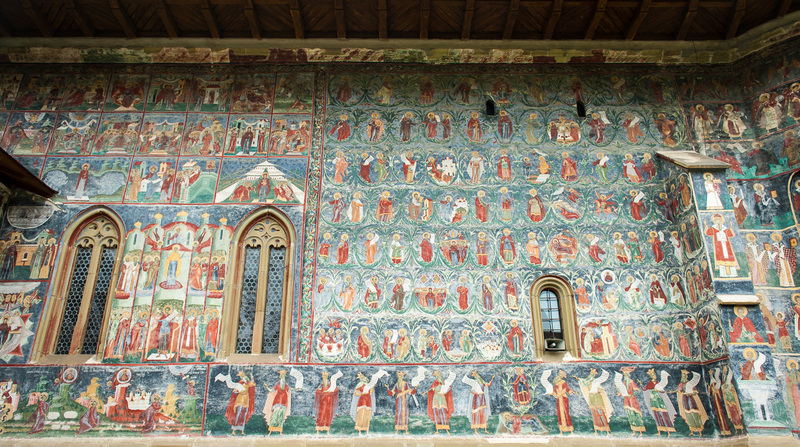 At the Voronet Monastery, the entire west wall is dedicated to the The Last Judgment. It is something that needs to be seen in person as no photos do it justice. The figures of the zodiac and God are in the top band. Jesus, flanked by Mary and John the Baptist are the major figures populating the second band. The Holy Spirit represented by a dove is in the center of the third band with a kneeling, humble Adam and Eve on either side of the dove. The three upper bands observe the judgement and separation by Archangel Michael of good (left) and bad (right) in the two lower bands. Next, we visited the Modoviţa Monastery. It was built in 1532 by Petru Rareş (Stefan's son). It was built as a barrier against the Ottoman Empire threat from the East. 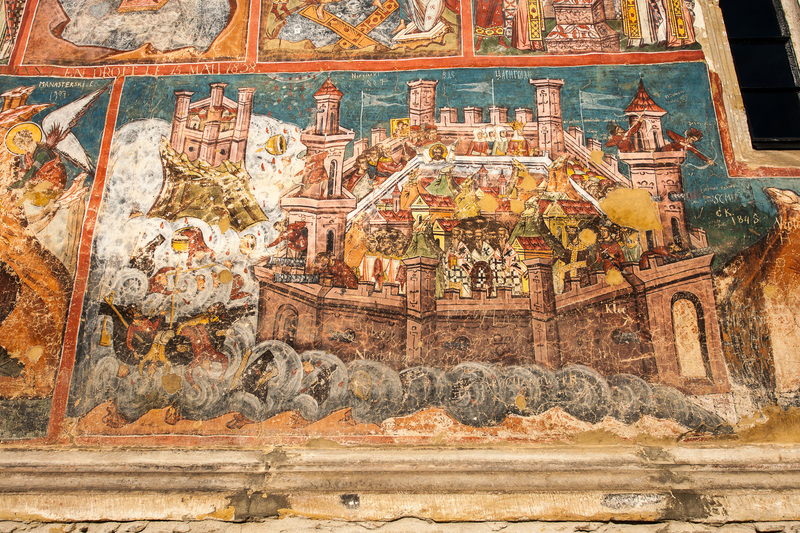 In addition to depicting the lives of saints and stories from the bible, one fresco illustrates the "Siege of Constantinople" which commemorates the intervention of the Virgin in saving the city of Constantinople from Persian attack in A.D. 626. 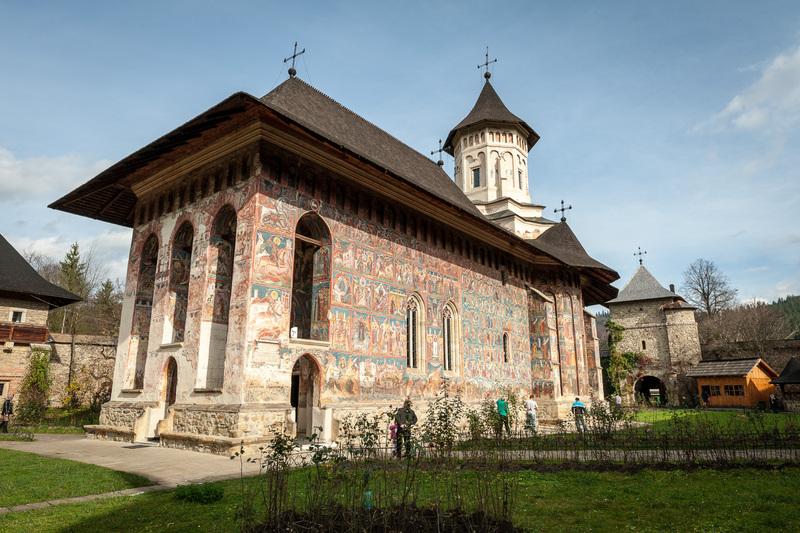 On monasteries built after the Ottomans controlled Moldova, it became politically dangerous to show Ottomans in a bad light; however, some creative artists painted Ottoman-style turbans on the heads of those in hell. 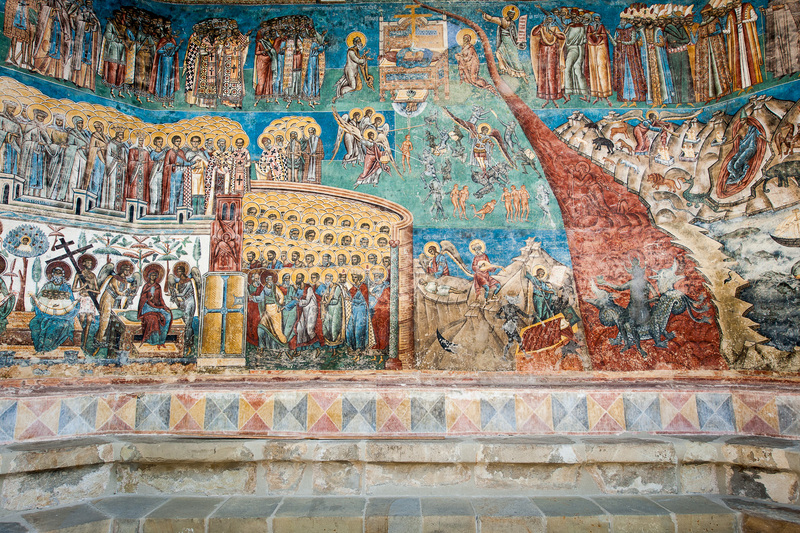 Yellow is the predominant accent color of the Modoviţa Monastery frescoes. The last visited painted monastery of the day was the largest monastery. Suceaviţa Monastery built in 1585 was not built or painted by either Stefan the Great or his son Petru Rareş. 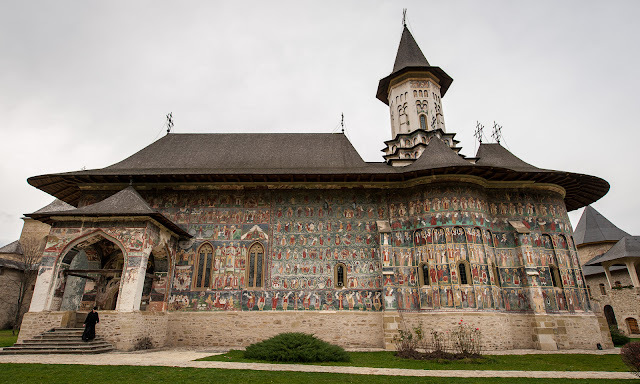 It is one of the last monasteries with exterior frescoes. It was built as a defensive residence and a monastery so it looks like a castle with its surrounding walls. Green is the predominant color of this monastery. The frescoes, painted in 1601, illustrate stories from the old and new testaments. My favorite fresco is called "32 Vanities." 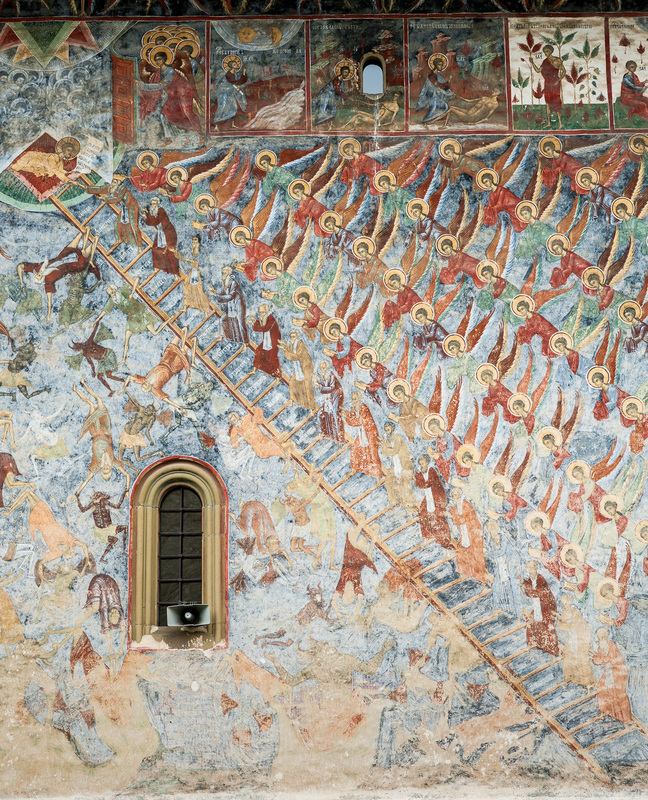 The fresco shows people climbing with a "vanity" on every rung of the ladder. One person makes it all the way to the last rung of the ladder, but is cast off the ladder because he still harbored one vanity. The rungs are labeled, but so far up that I couldn't read them.